When you want to be comfortable but you don’t want to compromise on style these bold green technostretch crop trousers by Beige Label are the ideal choice. 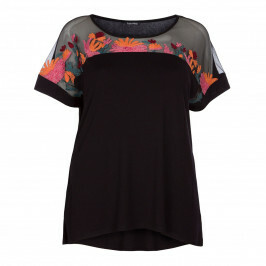 Perfect for travel they look utterly fabulous with the embroidered top by Luisa Viola. Cropped stretch trouser in mint green. 72% Viscose, 24% Polyamide, 4% Elastane. Delicate Machine Wash or Delicate Dry Clean. Model’s height is 180cm (5ft 11in) and she wears a UK size 18. For more information, please call customer services on +44 (0) 20 8455 0005, or one of our stores.